In this post I will try to bring together a few items from investigating the tragedy of MH17 and some of the background to the conflict as various parties, including the Ukrainian authorities, put more of their case forward. In describing the area of Eastern Ukraine from which the MH17 was likely downed as rebel-controlled, it is important to understand something of the nature of this conflict. This is not World War One with fixed lines of control. There is a patchwork of checkpoints and most fighting takes place in urban, populated areas. The area to the south of H21 (the main road in this area) is rural and it may be possible for a pro-Kiev armoured column to reach this area without meeting significant resistance. Many of the small towns here would likely have no organised pro-Russian or pro-Kiev forces, although local sources report a rebel outpost was set up in Stepano-Kynka (on 15 July) and pro-Kiev checkpoints were in place at Mospyne and Tarany. Ukrainian regular army morale is low, with a very high level of desertions. There have been numerous instances of army units being overwhelmed by local people, forced out of and abandoning their vehicles and unwilling to shoot at civilians, which lends some credibility to recent theories that a group of Ukrainian army deserters may have been in charge of a BUK in this area. As an aside, those soldiers, who genuinely see their job as to protect civilians, and have refused to take part in war crimes against the local population deserve praise. On the other hand we find openly fascist, fiercely Russophobe units of the formations such as the Avov Battalion (reportedly based not far to the south of this area) who have been committing war crimes including the indiscriminate use of Grad rockets against populated areas. Shizhne (aka Snezhnoye) is a small town in Eastern Ukraine which US intelligence say was the launch point for the missile which brought down MH17. One can imagine that local people would be incensed to have townsfolk, including children, being slaughtered in this way, and very keen that someone would provide them with protection, providing strong motivation for the rebels to deploy anti-aircraft assets to the area. On the other hand, given the (highly dubious) Ukrainian suggestion Russia was responsible for the bombing of Shizhne, it can be understood why Ukrainian military would have deployed BUKs in Zaroshchenske which is where Russian satellite imagery shows a group of BUK complexes, believed to belong to the 156th AA Missile Regiment, at 11.32 on the morning of the disaster. The map above shows the area around Shizhne (and if you hit the + button on the map above the location of Zaroshchenske). An SBU (Ukrainian KGB) provided photo of a BUK on a trailer shows the same vehicle in Torez, 30 km to the west, together with a UAZ-469 (featured image at top of page). According to a later report AP AP journalists saw the BUK moving through town at 1:05 p.m. The vehicle, which carried four 18-foot (5.5-meter) missiles, was in a convoy with two civilian cars. These towns are obviously all close to where the Russians say Ukrainian BUKs were located, in Zaroshchenske. However, the case outlined by the Ukrainian counterterrorism chief, Vitaly Naydais, is that a BUK launcher and trailer crossed the border from Russia at 1 am on July 17th, travelled westwards to Donetsk (200 km to the east), and then returned eastwards along the H21, fired a missile which hit MH17 and then returned to Russia that same night. As yet, no photographic or video evidence has produced of the BUK’s journey to Donetsk or from Donetsk to Zuhres. A short video clip, has been published by the SBU, which the interior minister Arsen Avakov initially said was filmed by an undercover unit in Krasnodon at 4.50am on the 18th. In fact, the video has been geolocated to Lugansk. 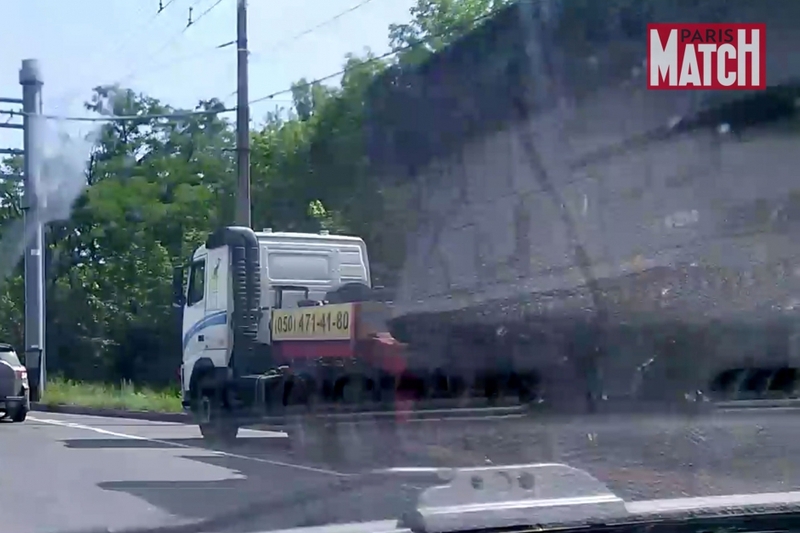 The video clip shows what may be the same trailer and BUK, with a missile missing, travelling into the Lugansk suburbs at an unknown time. Lugansk. on the 17th, was mainly rebel controlled (although parts were reported to have been taken by pro-Kiev forces on the 18th). This video clip does not show any support vehicles. The intersection it is filmed on is not on a direct route from Snivhne to the Russian border. To sum up, the Ukrainians have managed to put together a credible narrative but the scenario they present currently lacks concrete evidence, particularly of the BUK originating from or returning to Russia. The intercepts they have produced indicate that if the rebels did shoot the plane down, it was a mistake. The Russians have published satellite imagery of the area which shows Ukrainian BUKs very close to the area. They may have more satellite evidence of the movements of these BUKs and of the BUK(s) seen in Torez and Snizhne. The USA has not provided any data, but an intelligence assessment that the missile was fired from a “rebel-held area” that, as far as they know, the Russians weren’t involved and that the shooting down was a mistake. The rebel’s official line (in so far as the various groups have one) is that they weren’t involved, but it seems some rebel officials have been making admissions that their forces have made a dreadful error. Even if the plane was shot down in the belief it was a military plane, the crew could still be held responsible for a war crime if they did not take enough care to protect civilian lives. It is certainly possible that governments from which victims came will push for some kind of trial. This may give all parties (including pro-Kiev pilots and politicians) pause for thought, as any war crimes tribunal for Ukraine may consider the potential war crimes committed by the pro-Kiev side, including bombing of civilian areas from the air and by Grad rockets, in which 100s of civilians have also died. However, as we know, US allies and their proxies are rarely, if ever, held to account for their war crimes, and in the ICC the one-sided nature of international justice is there for all to see. As for the wider picture, the MH17 tragedy is a part of the greater Ukrainian tragedy which goes back to the control of the country by competing oligarchs and the failure to develop a unified sense of identity or mutual tolerance. The current attempts (by Ukraine’s nationalists and especially by neo-fascist forces) to destroy the Russian heritage and culture of the country is leading Ukraine deeper and deeper into disaster. Unfortunately, this is seen as a geo-political success by many in the US foreign policy establishment, who are glad of the opportunity to drive a wedge between Europe and Russia, forestall the creation of a Euroasian union and perhaps weaken Russia, an awkward obstacle to global hegemony. Nothing unusual about rebels wearing sand-coloured camouflage. There is a whole mix of camouflage worn by the rebels and that includes UK surplus DPM desert camouflage. Some of the rebels are wearing this desert camouflage complete with UK military insignia. There was one rebel interviewed on Sky News in the MH17 wreck field wearing old surplus UK desert camouflage complete with Royal Air Force title tags and Royal Air Force tactical recognition flash. This is the rebel in question. 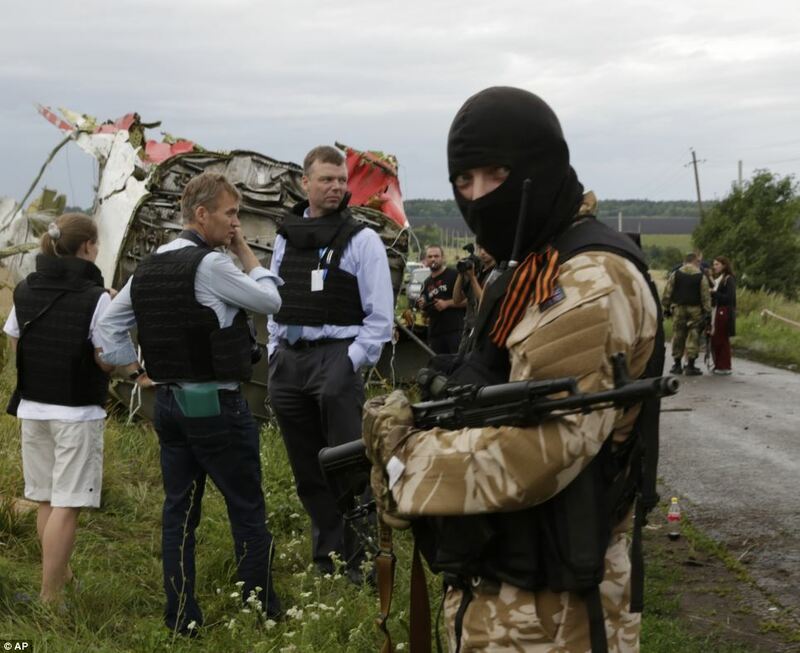 Rebel at MH17 crash site wearing UK Desert DPM complete with British flag still on shoulder. Thanks Tom. I would add the various nationalist militia wear a variety of kit as well, so telling which group any particular person, or even group of armed vehicles, belongs to is not always easy. The Kiev regime’s narrative also suggests separatists had no Buk systems of their own. Rather, someone else brought one in to their area, took it on some kind of tour through several towns thought accessible only to rebels and allies, and got it seen in each place. Then these people shot the airliner down themselves on the separatists’ behalf. That party is the Russians, they say. Yeah, the twist is in the definition of “Russian.” It probably was the same “Russians” whose air force bombed the apartment building there just before this … they have it in for the separatists. 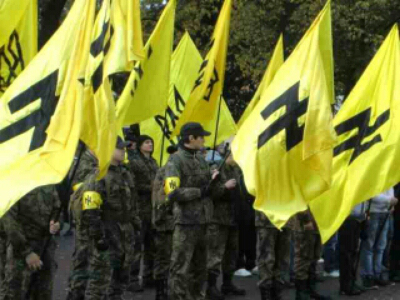 These “Russians” probably have pogroms planned for after their victory, I mean after Kiev’s victory, I mean yeeaah. Thanks – I’ve updated the AP link to an article by Peter Leonard on the AP site. The first thing the nationalists did when they seized power was to repeal the law giving regional rights to minority languages. Denigration of minority culture and heritage is a common facet of right wing nationalism, in Ukraine and Germany, as I am sure you are aware. What do you actually talk about? The European Charter for Regional or Minority Languages that Ukrainehas signed has not been chancelled according to wikipedia, therefore it is still in place. I am not aware of any change of law as you mention it – please provide a source. The nationalists passed a bill, without debate, to repeal the 2012 law which gave Russian the status of a regional language the second day after the flight of Yanukovic (23 February). After massive protests, Turchinov vetoed the bill 5 days later, but the nationalists had made their intentions clear. Wikipedia: On February 23, 2014, the second day after the flight of Viktor Yanukovich, while in a parliamentary session, a deputy from the “Batkivshchina” party, Vyacheslav Kyrylenko, moved to include in the agenda a bill to repeal the 2012 law “On the principles of the state language policy”. The motion was carried with 86% of the votes in favor–232 deputies in favor vs 37 opposed against the required minimum of 226 of 334 votes. The bill was included in the agenda, immediately put to a vote with no debate and approved with the same 232 voting in favor. The bill would have made Ukrainian the sole state language at all levels. The attempt to repeal the 2012 law “On the principles of the state language policy” was met with great disdain in Crimea and Southern and Eastern Ukraine, provoking waves of protests against the Maidan installed government ultimately culminating with the Crimean crisis. Passage of the repeal bill was met with regret by the Secretary-General of the Council of Europe. The OSCE High Commissioner on National Minorities expressed concern over possible further unrest. The bill was also criticized by the Ambassador for Human Rights of the Russian foreign ministry. Bulgarian and Romanian foreign ministers evaluated it as a step in the wrong direction, and the Greek foreign minister expressed disappointment. The Hungarian foreign ministry expressed serious concerns, noting that the decision “could question the commitment of the new Ukrainian administration towards democracy”. The Polish foreign minister called it a mistake. After urgently ordering a working group to draft a replacement law on February 27, acting President Oleksandr Turchynov vetoed the repeal bill on 28 February.